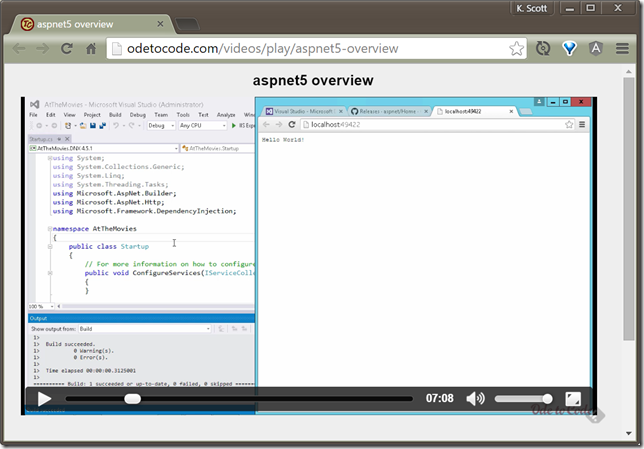 I recorded an ASP.NET 5 Overview during some unexpected free time and placed the video here on OdeToCode. I recorded during the beta6 / beta7 timeframe, so the video will need some updates in the future, else you'll find two vast and trunkless legs of stone here. Thanks Scott. Very informative and useful! Would love to see more of this type of thing on your site. Great course, as always. Can't wait for the next episode. Awesome as always. It is quite amazing how your videos / courses make us learn so much in so little time. Will the next episode be published here on your blog? Thanks! @Franciso: Probably, is all I can say right now. Will you be doing a pluralsight course of this too? This is an amazing video. Waiting for second part. Hi Scott, I've just finished watching your brilliant pluralsight video on Aurelia, using Visual Studio Code to build alongside you, and I've learnt a lot - so thank you! Now, I've just installed Visual Studio 2015 and tried to work with my new Aurelia site with that, but VS2015 doesn't seem to like ES6/7 syntax. I noticed you didn't have these issues in your video, am I doing something wrong in my setup? scott, watched the 'play by play' vid on pluralsight with u and dan yesterday. I struggle for words when it comes to that video vs. ur prepared videos. before i go any further, want to say you are my hero when it comes to learning new stuff as well as style of coding. "hero" is a big word, bland word, save the idolization aspect. yes, [with regard to play by play] i felt like jeez, i'm not the only one when i watched ALL three of you struggle with the 'border: 1px solid black' deal your videos and your presentations are so expertly crafted that... well one of the things i kept noticing in the 'play by play' vid is u sitting there, staring off. You were clearly, by body language, thinking about direction. (i don't choose my heroes lightly) you have a role on my team, not sure what it is yet. Hoping to take advantage of your ability to think clearly, even if it takes a few steps.